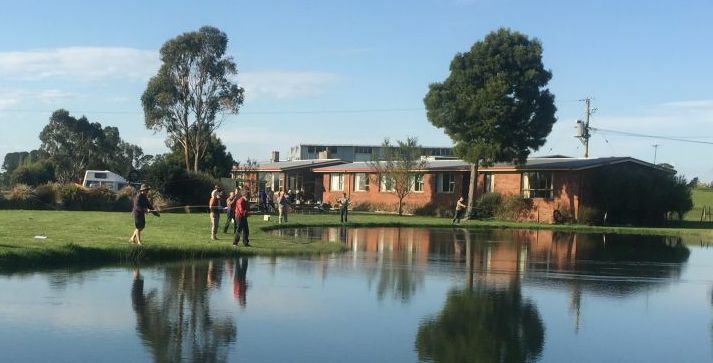 Just 30 minutes south of Launceston airport the lodge is in a rural setting on the banks of the premier Brumbys Creek tail-water fishery. It is just and just 5 minutes from the services of the township of Cressy. This area is regarded so highly that the World Fly Fishing Championships 2019 will be held in this region. 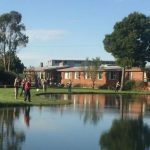 This position is in the heart of Tasmania’s best midland river fishing and central to rivers like the South Esk, North Esk, Macquarie, Meander, Mersey, St Pats and Lake River. A short and scenic 45 minute drive will have you in the iconic Highland lakes region. Lakes like Arthurs, Great Lake, Woods Lake, Penstock Lagoon, Little Pine lagoon and the nineteen lagoons are all accessible as day trip destinations. The ‘Hayes on Brumbys’ fly fishing lodge has 9 twin single rooms and one double room, sleeping a total of 20 people. All facilities are shared. The outdoor BBQ area and seating beside the purpose built casting pool overlooks the magnificent mighty Western Tiers. A large and well equipped kitchen adjoins a dining room that looks over the garden to the casting pool. At the other end of the building a 30 seat conference room is ideal for fly tying classes and other fly fishing workshop activities. Although the prime use of this lodge is as a fishing lodge, it is often leased for other interest groups.